Last fall a 9,000-square-foot commercial building was demolished in the heart of a Main Street district in Virginia to create more parking. The loss of the building permanently erased a piece of the architectural history and character of the historic downtown. It also opened up a 35-foot-long hole in the urban fabric of the historic district and may have increased the cost of creating future commercial and residential uses on the parcel, uses that are critical to the vitality of every downtown. The demolition sent an estimated 800 tons of debris to the local landfill, reduced the property taxes contributed by the parcel to the local government by two-thirds, created no new businesses or jobs and added no new residents or employees to the downtown. 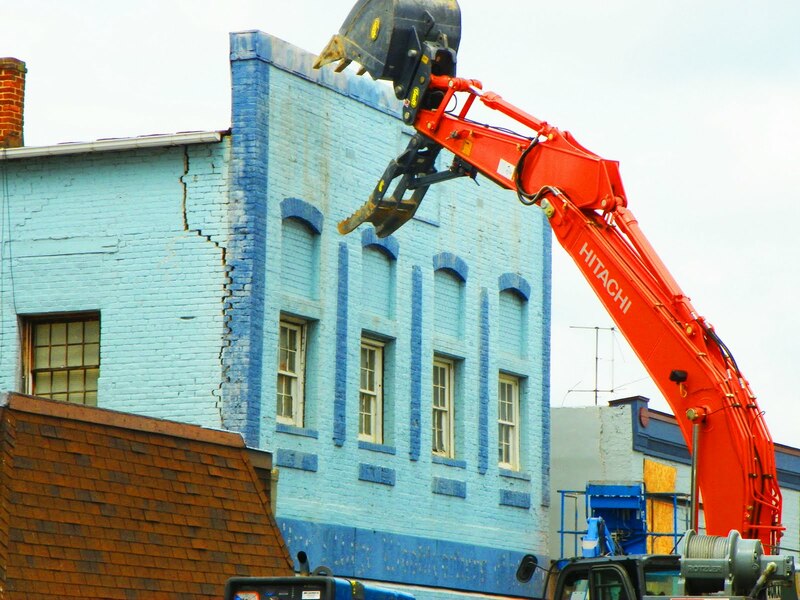 In short, the demolition permanently removed a valuable asset from the Main Street district, and the hole in the street front will likely prove to be a long-term drag to the economic revitalization of the downtown. Historic preservation is a cornerstone of the Main Street approach to downtown revitalization. Virginia’s historic downtowns were never islands unto themselves, but were, rather, once the hubs of economic and cultural activity in their regions. As such, they were the focus of a tremendous amount of financial investment and cultural expression by the residents of the regions surrounding the downtowns. The result is the unique historic architecture and pedestrian-friendly commercial districts that characterize Virginia’s Main Street communities. The preservation of these unique built environments maintains the cultural and economic hearts of Virginia’s Main Street districts and provides substantial economic benefits to local communities. Despite some losses, Virginia’s Main Street organizations are working with property owners to preserve, rehabilitate and reuse the historic built assets in their downtowns. 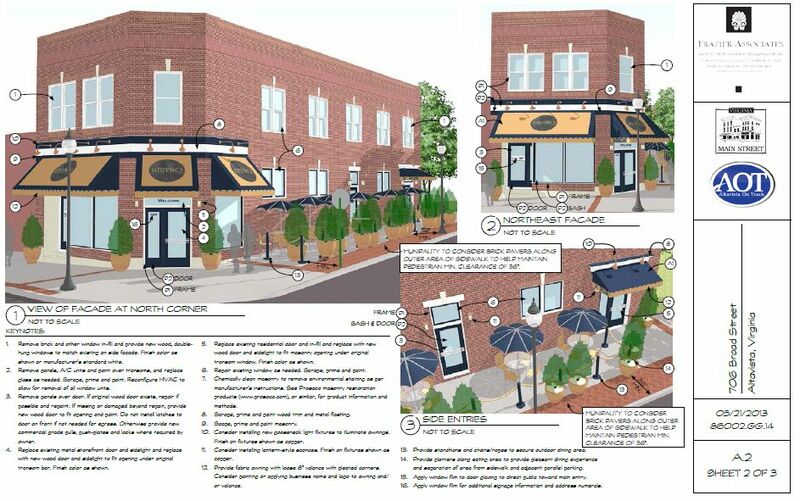 Example of facade design assistance provided by Frazier Associates. Walk through any Main Street community and you will see refurbished facades with new paint, re-exposed store windows, repaired brickwork and new awnings. Local Main Street organizations facilitated many of these improvement projects with design assistance funded by VMS and provided to private property owners by Frazier Associates. Many property owners just need design assistance and are able to fund the façade improvements themselves while others take advantage of façade improvement grant and loan programs like those in Hopewell, South Boston and Fredericksburg. With funding from VMS, Bedford, Bristol, Luray, Lynchburg, Marion, Martinsville, South Boston, St. Paul, and Waynesboro have developed financial feasibility studies for major historic, vacant or underused buildings in their Main Street districts. These organizations worked with owners of large “white elephant” buildings in the Main Street district to develop preliminary engineering and architecture reports, market demand studies for proposed reuses of the buildings and financial assistance packages. Prepared with this valuable information, the Main Street organizations are working to find potential property developers who can return these buildings to their status as major downtown assets. Some Main Street organizations have even taken on ownership of historic buildings in order to save them from demolition until the right property developer could be located. Three years ago, after one of South Boston’s final three remaining tobacco warehouses burned and a second was demolished and sold off for the value of its bricks, the New Brick Warehouse, built in 1900, the last standing tobacco warehouse in South Boston, was also slated to be sold off for bricks. Saving the historic warehouse from demolition was a high priority for Destination Downtown South Boston (DDSB), South Boston’s Main Street organization. DDSB convinced the building’s owner that there was more financial gain in donating the building to DDSB, a 501-C-3 non-profit organization, for a charitable donation tax deduction than there was in demolishing and selling off the bricks. Working with Preservation Virginia and the town government, the Main Street organization found a developer who was able to preserve the building and rehabilitate it for market rate downtown housing, which is in short supply in South Boston. The $2.6 million New Brick Historic Lofts will open January 2014, adding more than 20 new, market-rate housing units to downtown South Boston and preserving a piece of architectural tobacco heritage that is unique and authentic to South Boston. What is Main Street Worth?